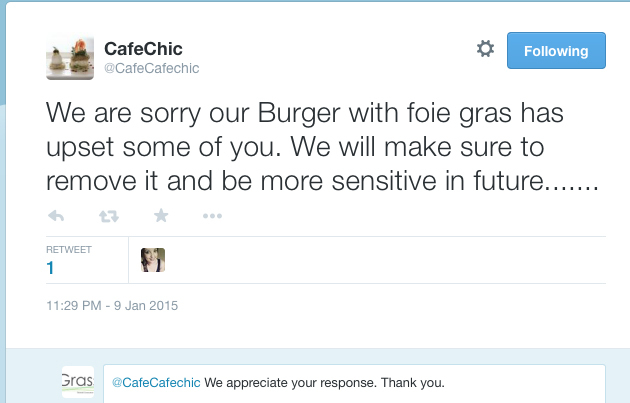 I congratulated Café Chic for deciding to remove foie gras from their menu. Situated in Breda Street, Cape Town, it is owned by Conrad Gallagher a celebrated Michelin starred chef, and his wife, Candice. Café Chic serves lunch, dinner and late night cocktails. Email (info@cafechicsa.com) or tweet (@CafeCafeChic) to tell them that you think this is really awesome news. They responded almost immediately and offered no excuses for initially promoting foie gras on their menu. Truly professional. Since I have not visited yet, EATegrity cannot vouch for their other menu items but you can see what Eat Out has to say about them here. You can also sign up for our updates and receive a Mindful Monday recipe each week.